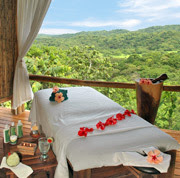 Twenty minutes outside of Tamarindo, Costa Rica is a five star destination for the ultimate in rejuvenation. Los Altos de Eros, is a luxury inn, spa and yoga retreat carved into the side of a hill with incredible ocean and tropical forest views. The twenty seven acre estate is the ultimate for anyone seeking privacy and security, as it offers only five rooms (2 poolside and one luxury suite). The spa services include body scrubs, soaks, and wraps alongside basics such as hand and foot massage therapy. 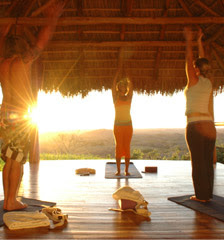 The site also offer a beautifully situated ashram that offers private and semi private yoga lessons. 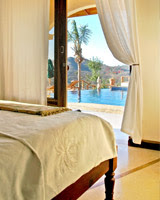 Add to that a gorgeous infinity pool, a gym, and great food and you might never want to leave. But if you just can't get exploration out of your veins then Los Altos de Eros accommodates with transportation at no cost, and will deliver you to any number of spots in the area for great surfing, sailing, world class golfing or wilderness exploring. The rates are what are most astounding at $395 for a queen room to $595 for the ultimate luxury suite, which includes all transportation (no car rental necessary), all breakfast and lunches and dinners on Tuesdays and Saturdays, as well as all beverages (including wine, beer, mixed drinks) during your stay. Keep in mind the strong dollar in the region, and you have the makings of a great, intimate getaway with all the celebrity privacy and perks without the typical price pinch.